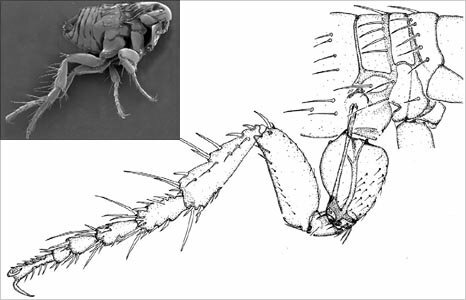 Cambridge University scientists have solved the mystery of how fleas jump so far and so fast. It was known that the energy to catapult a flea over a distance up to 200 times its body length lay in a spring-like structure in its body. But scientists did not understand how they transferred this energy to the ground in order to jump. 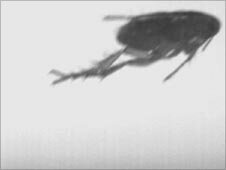 High-speed footage now reveals that the secret lies in the way fleas use their hind legs as multi-jointed levers. This "lever-effect" allows fleas to drive their feet onto the ground, and the sudden release of the "coiled spring" hurls the insect forwards and upwards, scientists report in the Journal of Experimental Biology. Half a century ago two groups of researchers first discovered that the energy for the insects' jumping ability was contained in an internal spring, rather than in the fleas' miniature muscles. 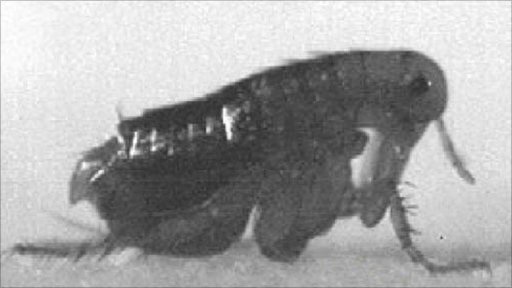 Spines on the back of the flea's hind leg grip the ground for "take-off"
This discovery led to two competing theories about the insects' agility. While one group surmised that fleas bounced upward from their knees, the other said that the recoil of the spring acted through the joints of the hind legs, pushing the flea's feet onto the ground. From this "crouch" position, the insect could spring upwards. Dr Gregory Sutton and Professor Malcolm Burrows from the University of Cambridge, who led the new research, wanted finally to end this controversy. Dr Sutton, whose research was funded by the Human Frontiers Research Program, hopes ultimately to design robots that can jump as high as the insects. "If you look at the actions and movements animals can generate, they are so much better than modern machines," he told BBC News. "So I was interested in studying exactly how they generate these movements." Like his predecessors, Dr Sutton drew his first clues from detailed anatomical studies of the fleas. These revealed relatively large spines near the insects' feet; structures that suggested that it was these areas that gripped the ground for traction. The biggest revelation came from high-speed footage, which was painstakingly shot throughout a week where the researchers had to work out how to persuade a flea to jump at the right time, in shot and in focus. "We finally figured out that the fleas wouldn't jump if it was dark," Dr Sutton explained. "So we'd turn off the lights, move the camera and chamber to get the flea in plane, then zap the lights on and the flea would jump along the plane of the camera." When the researchers modelled the trajectory of each flea's jump, it matched exactly the trajectory that was worked out in 1967 by a British scientist named Henry Bennet-Clark. "That was the smoking flea," said Dr Sutton. "Our data was an exact match with the Bennett Clark data." Some aspects of the flea's agility is still unclear. "They always jump in the same direction and so we think they may be limited," he told BBC News. "And we don't know how the flea locks its legs into position when it's charging the spring." Dr Sutton added: "This just shows us how little we know about [the abilities of] very common insects."